Driving is a rite of passage for teens and a staple of the American high school experience. Although California has seen over a 10% decrease in the number of teen drivers in the last decade, the traffic jam that is the student parking lot is proof enough that M-A has no shortage of drivers. To become a driver, though, you must first win in a battle of seemingly insurmountable odds. One where everything you do is held against you, where even the tamest of mistakes is bombarded with unreserved scrutiny. I speak, of course, of the driver’s test. Of course, not everyone has such immediate success. Another junior, Ian Reis, is one of these unfortunate few. “I did my fifty hours, in fact, I probably did more than that, but I still failed. I forgot to check my blind spot, which was simple enough, but that instantly failed me”, he said. Reis went to the Redwood City Department of Motor Vehicles (DMV), which is the closest DMV to M-A. It is a good idea to be aware of which office one takes their test at. Each office has its benefits and drawbacks, but at the end of the day, what matters is the outcome of the test. With this in mind, here are the three primary options for DMVs in the Menlo Park/Palo Alto area. While it may be the most conveniently located, the Redwood City DMV has some serious drawbacks. Out of all the local DMV, the Redwood City office is notorious for the difficulty of its driving test. “The best way to describe the Redwood City DMV is as frustrating,” said Will Flanagan, junior, and a Redwood City DMV driving test alum. “The driving test is not particularly easy, but my driving instructor was reading a newspaper, which gave me slightly more leeway. On the flip side, the wait was horrible.” He went on to say that “unless you want to lose your entire afternoon, go to any other office”. One thing to be conscious of with the Redwood City test is that the routes generally take the driver through downtown Redwood City. While this, in theory, doesn’t sound particularly difficult, the increase in pedestrians and cars creates a whole new category of rules and regulations to be aware of. It is important to be comfortable driving in an urban environment, but it is an additional speed bump in the route to passing the test. The Redwood City office is half the distance to M-A as the next closest DMV, San Mateo, and is open on Saturdays, a service provided by neither San Mateo nor Fremont. Convenient as it is, choosing to go here is truly a matter of personal preference, as the test is harder and the wait longer than other DMVs. An example route of the Redwood City driver’s test. The San Mateo DMV, according to students who took their driver’s test there, offers a relatively easy testing experience. M-A junior Nate Holley, who got his license last March at the San Mateo office said, “My driving instructor was pretty relaxed, and the route was pretty simplistic. I know it’s slightly farther away than Redwood City, but it’s definitely worth it.” This seems to be the common sentiment among students towards the San Mateo DMV, as junior Martin Determan also stated, “The San Mateo DMV is definitely the way to go.” Despite this, there are a few things to stay aware of during the test. 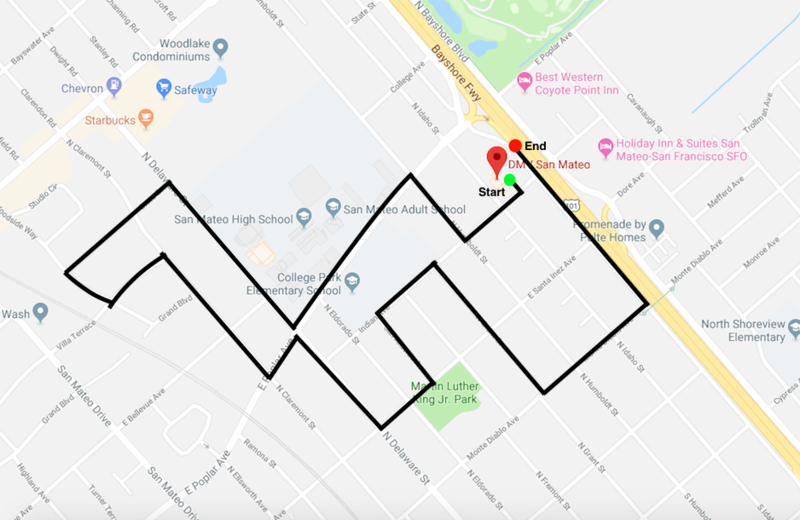 The office in San Mateo is in the vicinity of three different schools, and the one documented driving route passes by two of them. While the data set is pretty small (in terms of the documented driving routes found online), the sheer volume and proximity of schools around the San Mateo office mean that any given route will likely pass one or more of these zones. In other words, be aware of school zones throughout the test, as any speed over 25 miles per hour, as Holley mentioned, results in instant disqualification. Overall, the San Mateo DMV provides a good alternative to the Redwood City DMV. It offers an easier driving test, though its relative distance is definitely a factor to consider when making the choice. An example route of the San Mateo driver’s test. The Fremont DMV is on the other side of the bay and is a pain to get to from Menlo Park, but it is the best option for those who have “struggled” with driving tests in the past. The driving test is notoriously easy, and the routes themselves are simple and well-documented. Derek Golop, a senior, failed his first driving test at the San Mateo DMV. In comparison, he said that the Fremont “test itself was pretty straightforward.” He got his license on his first try at the Fremont DMV. “The fact that I passed at all is an indication of its easiness,” he said. “They gave a lot of room for error, which made the test itself much easier than that of the San Mateo DMV.” DMV tests should generally be of a similar difficulty, regardless of what office it is taken at, but the Fremont office offers an easier alternative for those who need one. Looking at some of the actual routes used by the Fremont DMV, the attentive viewer will notice that they tend to stay on more residential roads, avoiding those that are broader and more widely driven. Additionally, the routes much more rarely pass by schools, unlike the San Mateo test, and they don’t have a business portion, unlike the Redwood City routes. While the Fremont DMV is a little bit more of a schlep, it is worth the extra distance for the struggling motorist. An example route of the Fremont driver’s test.